We finished the last issue with the headboard and footboard complete, and this month we're going to join them up with side rails and slat bearers, and start to see more of a finished article. 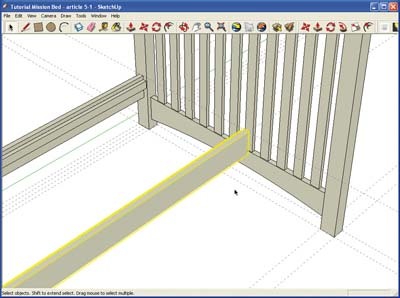 The first thing we're going to do is create the long side rails, but so that we can see what we're doing more clearly, you need to hide one end or other of your bed. In this instance I would suggest the footboard, and the main reason for this is so that you can continue, as far as possible, to work on your model from the same point of view. So, having selected the footboard and hidden it, and you can now set about creating the two guides that will give you the shape and position of the first side rail. It's easier if we do this at 'ground level' and then move the finished rail into position later. 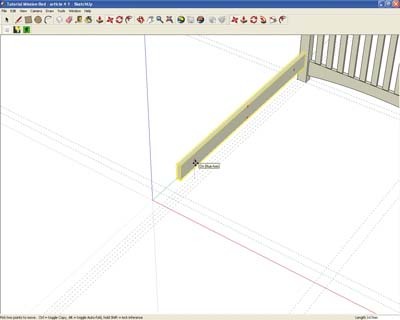 As this rail is centred on the legs, and is 30 mm thick, we need to create two guides using the Tape Measure tool , 30 mm in from each edge of the leg, and parallel to the green axis. With these guides in place we can draw the rectangle that will form the basis of our new side rail. You need to be zoomed into the bottom of the leg, and having selected the Rectangle tool, snap first to one of the intersections between your new guides and the base of the leg, zoom out and pan to the opposite corner. (Don't forget that the Rectangle tool will remain active whilst you are doing this, and you just need to click on the 'greyed out' button to resume drawing). Snap to the diagonally opposite corner. With your completed a rectangle in place, you are now ready to use the Push/ Pull tool to extrude it to a height of 150 mm. Drag upwards, release your mouse without clicking anywhere, and type 150 on the keyboard. 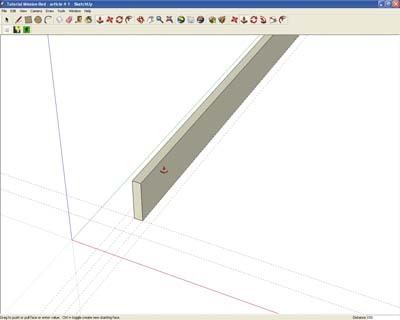 Your rectangle is extruded to exactly 150mm, which you can check using the Tape Measure tool. Before we start moving the completed side rail into position we need to remember to turn it into a component. 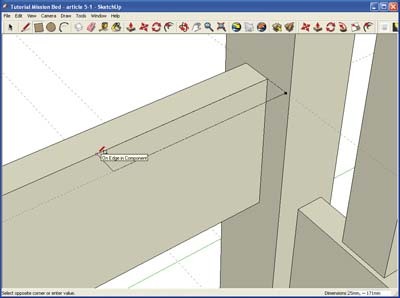 Select all the faces and edges in your side rail by a triple clicking anywhere on it, and then select the Make Component option when you right click on your mouse. call it something exciting like 'Side Rail!' 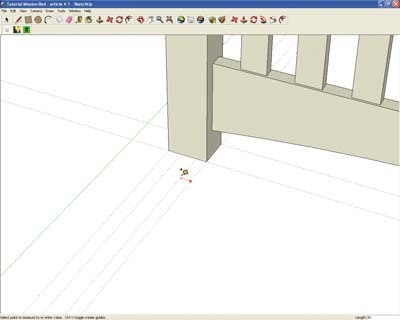 Now, using the Move tool, position the newly created rail 225 mm above ground level. I'll just remind you again, all you need to do is start moving the rail in an upwards direction along the blue axis and type 225 on your keyboard. 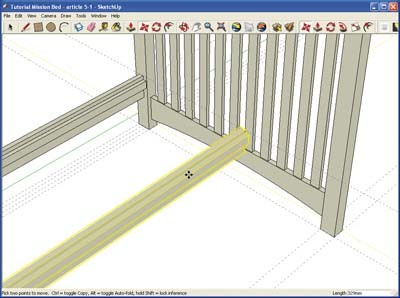 This is automatically entered into the vcb in the bottom right hand corner of the SketchUp screen and your rail will move exactly 225 units upwards. With the side rail in place we are now ready for the task of putting in the slats bearer, which runs along the inner face of the inner face of the side rail. This bearer is 25 mm wide, 50mm deep and set down 25mm from the top edge of the side rail. You need to create some more guides, but this time at the level of the top of the rail. Firstly, position 2 guides along the red axis at each end of the top of the side rail, and then another guide along the green axis 25 mm from the inner top edge of the side rail. Snapping to the guide intersections and the diagonally opposite corner of the rail, create a rectangle the same length as the rail, and 25mm wide. 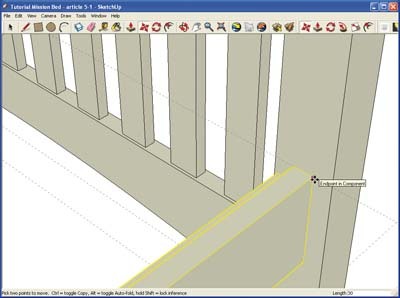 Once again this will involve you in panning and zooming out and then in, at the same time as you are drawing, and then clicking on your 'greyed out' Rectangle tool button. Because 3D modelling mimics the real world, to some extent anyway, it's very easy to start thinking of the 'things'you are making in the same way as real objects, so what we are going to do next might seem a bit strange. 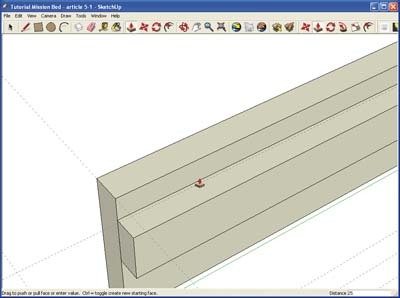 In the real world, you would make your slat bearer 25mm thick by 50mm wide, cut it to length, and then measure down 25mm from the top edge of the rail to position it. This is what we just did with the side rail. Instead, we are going to extrude our rectangle 75 mm downwards, and then take 25 mm off the top, using the Push/Pull tool for both operations. Hover the Push/Pull cursor over the rectangle you have just drawn, and 'pull' downwards, typing in 75 without clicking anywhere. Then move the tool back to the top face and 'squash' your slat bearer down by 25mm in the same way. Don't forget at this point to make a component out of your newly formed bearer. Having created one side rail and bearer, what we are going to do now is copy and reverse them to create a matching pair on the other side. 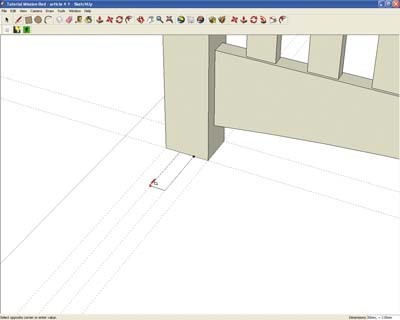 Select both the bearer and the side rail, click on the Move tool and drag both objects across towards the opposite leg and along the red axis, pressing the Ctrl Key (Option on the Mac) as you do so. 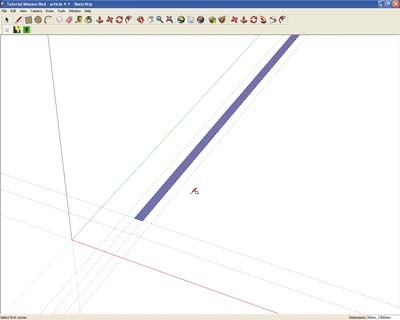 Your copied objects appear, and ensure that the line for your movement remains along the red axis. 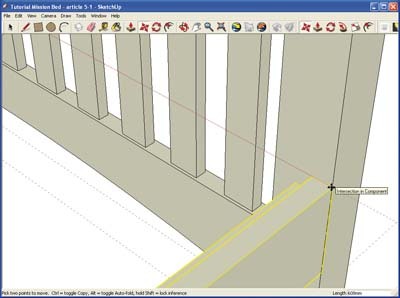 About halfway between the two legs, right click and select the Flip along red axis option. This will reverse your copy and put it the right way round. Now zoom in and resume moving the copy, picking it up by snapping to the top right hand corner and moving it so the outer face of the rail is flush with the outer face of the leg. You can do this because the guide that you created at the end of the original rail intersects the outer edge of the opposite leg, and you will just snap to this point. You can now move your copied rail and bearer 30 mm back, so that they are positioned correctly in the centre of the leg. 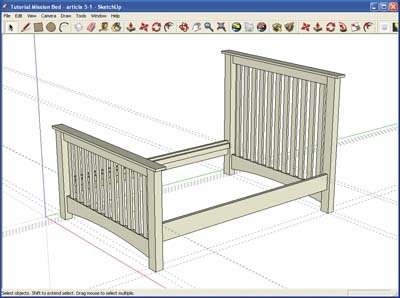 The bed is now starting to look the part, and in the next issue we will be able to complete the modeling process, adding the slats and central slat bearer, before going on to look at adding colour, wood grain and shadows.